Euro-C.B. (Phils) Inc. proudly present the new MULTIROOM SYSTEM! 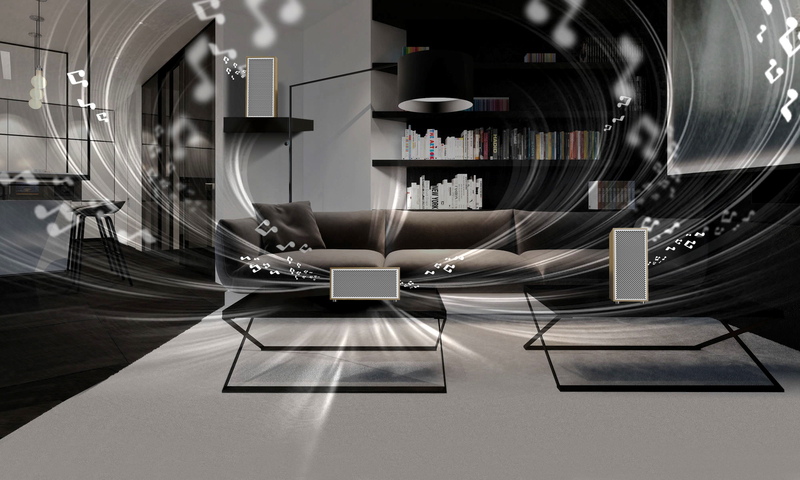 Enjoy your music in every rooms of your home with this wireless speaker system controllable by the Multiroom app. Select which speakers you want to activate and adjust all parameters using your fingertips! With the MULTIROOM SYSTEM, music accompanies you wherever you are. Simple! The MULTIROOM SYSTEM connects up to 5 wireless speakers for optimal distribution of your favorite music from your own files to the web (Youtube...) or directly via your usual streaming applications (Spotify, Deezer, Youtube, Qobuz, etc.). The "BASE" or Master Speaker of the MULTIROOM SYSTEM also has an outlet 3.5mm jack that allows you to connect any other non Bluetooth device. Room to bedroom to the kitchen, your favorite content accompany you daily in all parts of your house! The volume of each speaker and the various amplification settings are adjustable from your Bluetooth enabled smartphone or tablet. The MULTIROOM SYSTEM mobile application also offers the possibility to name each according to their location for a completely customizable navigation. No special configuration is required! Simply download the application and select the satellites you want to activate to control your music. More Details: What is Multiroom?